Rob Barnosky grew up in western Montana fishing rivers such as the Ruby and Jefferson, before finding his favorite waters in Wyoming. He now guides each day on the Gray Reef, Miracle Mile, Fremont canyon, and the Big Horn. He has a gift for getting to know people. Working in Wyoming’s beautiful outdoors, and sharing his love of fishing attracted him to work as a guide. Rob prides himself on being hard working, patient, and focused on your experience. 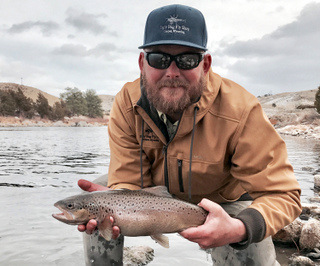 He strives to ensure that at the end of every day with him you have not only caught Wyoming’s beautiful trout, but also grown as an angler, enjoyed your time with him as a guide, and left with the impression that he worked as hard as possible to provide your ideal day. In addition to guiding, he works as a counselor for children. If he’ s not guiding or counseling, then he is likely chasing his daughter, Jaylee, with his wife, Angie.